Post offices are usually open from 8 am to 12 noon and 2 pm to 5 pm on weekdays, although some branches in shopping centres often open the same hours as the shopping centres, and this includes late night shopping (usually Thursdays). On Saturdays, post offices in large cities are open from 8.30 am till 12 noon, but don’t count on it in villages. 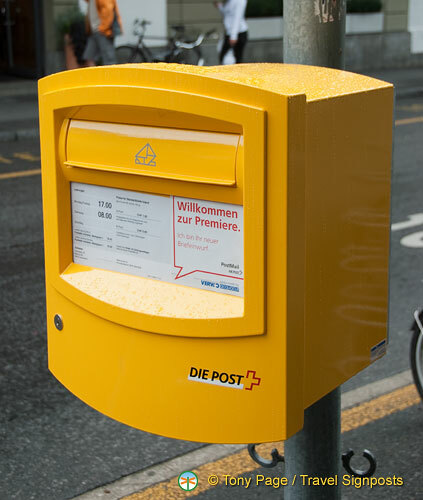 In Switzerland, Mail boxes are coloured yellow and can be found along street and in every Post Office. Mail collection time are displayed on them. The Swiss mail service is efficient: allow 24 hours for a letter sent in Switzerland to a destination in Switzerland; from Switzerland to abroad, allow 1 to 5 days. Larry, this post is about the Swiss Postal Service! We do have a post about Telecommunications in Switzerland though.